If you thought that all delicious ice cream was made with dairy, then you could be mistaken. If you are lactose-intolerant or avoiding dairy for any particular reason, then Turtle Mountain's Purely Decadent ice cream, made with coconut milk is a fabulous, delicious alternative to traditional ice cream. Coconut milk is perfect for the creamy, sweet taste of this perfect, dreamy ice cream. Not only does it taste just as good than regular ice cream, it is a lot better for your health, too! Purely Decadent ice creams are also pretty low in fat, calories, AND sugar. Think it can't get any better? They contain absolutely NO cholesterol and are made with all certified organic ingredients. They are also gluten-free. The only thing added to give a little extra oomph is agave natural sweetener. The ingredients are pretty basic, no complicated chemical names for you to look up, which is the way I prefer my treats! The ice cream comes in a variety of fabulous flavors as well. My own personal favorite is the Cherry Amaretto flavor -- with 130 calories, 6 grams of fat, 6 grams of fiber and 1 gram of protein per serving. But, there are several other equally delectable flavors (some lower calorie than others) that are available including Chocolate, Coconut, Cookie Dough, Mint Chip, Cookies and Cream, Mocha Almond Fudge, Passionate Mango, and of course, the classic Vanilla Bean. The company also manufactures many other tasty treats such as low calorie ice cream sandwiches, coconut almond minis, coconut milk, and even low calorie coconut milk yogurt. And if you are in the mood for other coconut ideas, make sure you check out Crispy Cat bars, and my posting on coconut water. And don't even think you are going to have to go scavenger-hunting all over the country to find a pint of this delicious frozen treat. Turtle Mountain's Purely Decadent coconut milk ice creams are readily available at the majority of grocery stores, usually next to the regular ice creams and other frozen deserts, and they are continuing to become ever increasingly popular around the USA. I buy mine at Whole Foods. One disclaimer, though... you may not like this ice cream if you don't like coconut. It is, in fact, made with coconut milk so there can be a smidgen of coconut flavor in there. So if you happen to be a serious coconut-hater, you might want to skip out on this ice cream. Then again, you might be pleasantly surprised! And if you dislike coconut, have no fear. I will be posting about more low calorie ice creams and other low calorie desserts very soon. Oh that sounds so good, how come you dont post the weight watcher points anymore? I'm so glad you discovered my favorite dairy-free ice cream. My eight-year-old daughter and I have been enjoying the chocolate and cookie dough flavors for some time now. I'm looking forward to trying the Turtle Trails flavor. That sounds really good! Happy, happy, joy, joy! 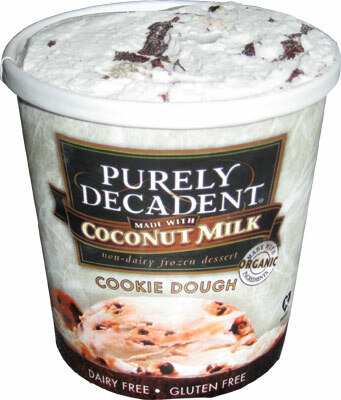 I love Purely Decadent! It's amazing to be able to enjoy something that tastes so good with only half the fat and 1/3 fewer calories than full fat dairy ice cream. I love all their flavors so much, it's hard to decide on just one at a time.